You don’t need much to build a cardboard house and if you are stuck inside this winter, you might build something really interesting! (To see a world famous architect who uses cardboard/paper to make structures in the world, read about architect Shigeru Ban. A couple of the houses are from kits, but generally you can make them with cardboard that comes as packing material, or in the back of your local grocery store. Some of them are cute because you paint them, others are simply brown cardboard and elegant for their design. If you do make one, please send us a photo. Send to jcowan@solidprint.com and we will add it to a gallery. 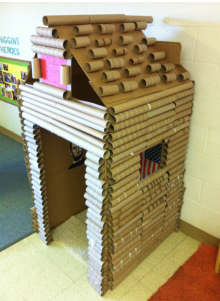 Photo of house made of cardboard rolls from http://playtivities.com/cardboard-houses/.